Attention race directors and potential race directors! Here is a checklist of race director tasks and helpful tips. Be prepared for some hard work. Enlist some people to help with the event early in the process and divide up the responsibilities. You have to really love running and racing (or the charity that the event might benefit) to put up with the demands of race directing. Create a checklist. As a starting point, create a checklist for each item to be accomplished (along with a goal date for completion and "assignment" line if a group of volunteers is working together). Select a distance (5K, 8K, 10K, etc.). It's easier to focus on just one distance (e.g., 5K) than multiple distances (5K/10K/Half Marathon). However, there are a lot of 5K's and fewer 10K's around. Different distances, such as 8K, 4 miles, 10 miles, might be appealing to some runners, but some prefer the standard distances. You can offer a 1 Mile or a 1K "fun run" for kids/walkers. This event can still charge full price if runners/walkers get a T-shirt, or maybe a discount without a shirt. The timing service can time people in this short "fun" event (or not), but awards aren't usually presented. All runners in the fun event might get a ribbon (especially young kids). Event name. Try to come up with a good theme for the race and maybe a catchy name (e.g., Jingle Bell, Hot'n'Hilly, Run with the Wind, Four States Flattest 5, Insomnia Run, Sunshine Run, Turkey Trot, Midnight Madness, Race Across Kansas, Route 66 Classic, etc.). A good cause. Maybe the race can benefit a local charity, a middle school cross country team, or an especially attractive national charity. Many runners might be more inclined to participate if it's for a good cause. A good charity might motivate workers who would be willing to volunteer at the race. Fundraising. Many people want to organize a race to raise money for a charity. For a race like a 5K or 10K, it is difficult to raise much money just from the runners' entry fees since these fees are usually limited to what most other races charge (maybe $15-$20) and there are many expenses (shirts, trophies, timing service, food, insurance, police, etc.). It is customary for half marathons and marathons to charge more (perhaps, $25-$35 for a half marathon and $40-$70 for a marathon), but these races are a bit more difficult to organize. Some people organize a running event and then use the event as a springboard to get sponsors and other donations for the charity. Right to include coupons and/or other items in goodie bag presented to each runner. Access to runner database (name/address, etc.) after the race. Insurance. Determine the need for insurance for your event. Insurance will protect you, your organization and your sponsors in the unfortunate event of injury to a participant or other unforeseen circumstances. While most all races require participants to sign a waiver, case law is such that you don't want to leave anything to chance. Most local insurance agents have event insurance available at a minimal cost and it's worth at least checking into. The course. Many runners prefer a flat or rolling course for a possible PR, but sometimes runners like a challenging course that they can tell stories about. Trail races may be a good alternative. Good scenery can be appealing. Avoid high traffic areas, busy intersections, crossing busy streets, and busy times of the day. You will probably need to file a request to use city streets with the local police 30 days in advance and most cities will require a certificate of insurance. If you plan to use trails in a park (or other park facilities), you may also need a permit from the park authority. A course close to a metropolitan area will attract more runners, but an especially interesting course out of town can also succeed. You should try to select a course that probably won't change from year to year, especially if you plan on certifying the course. Laying out the course. Even if the course isn't going to be certified, make sure you measure it carefully with a GPS device. If you are using a car, you should probably add about 2% because the car can't cut all the tangents (shortest possible distance) like a runner can. So for a 5K, measure 3.15 miles; for a 10K, measure 6.3 miles; etc. If you use a bike and can cut the tangents, you won't need to add anything. DON'T MAKE THE COURSE TOO SHORT! Try to document the course's start, finish, and mile/half mile/ 1K markers according to fixed landmarks (like fire hydrants, stop signs, etc.) so you can locate these positions year after year. You should paint directional arrows on the course with bright paint the day before the race (but be careful--local residents might not like you painting on the streets and you might give runners a bad reputation). You should also use signs with arrows and/or orange cones to clearly mark the course. If you have volunteers you can station one at each turn to tell runners where to go. If you wish to have your course certified, contact USATF. The date and time. There are races about every weekend, so this is tough. You may want to do an early spring or late fall race when temperatures are cooler. Races in very cold or very hot weather may not be especially well-attended. Try not to bump up against an established race. Saturday races are the tradition--Sunday races are often not attended very well. The 8:00 am start time is the most popular. An earlier time is risky, but may be necessary for a hot race. 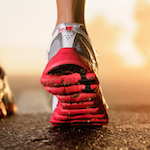 Later than 8:00 am runs the risk of interfering with runners' other weekend activities. The price. Most 5K's and 10K's are $20-$40 per person. Half marathons usually charge $50-$60 and marathons $75-125, depending on the goodies offered (food, shirts, medals, awards, cash prizes, etc.). It's difficult to raise a lot of money with a small 5K or 10K, so you'd better be doing this for more than just money. Many charities just like the public awareness generated by the race so they can solicit other donations. I wouldn't recommend offering cash prizes because this will cost you a lot of money and will only attract an extra handful of runners who think they can win the cash. Online registration. Many runners will print an entry form from a web site and mail it in, or register in person at the running store or at the race. However, more and more runners prefer to register online (which usually costs an extra 5%, but the convenience is worth it). 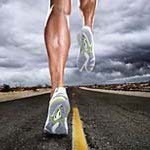 You should set up online registration at a site such as www.LocalRaces.com. Then the race web site can link to the online registration. You may get as many as 10%-20% (or more) to register this way. A race timing service. Select a reputable race timing service. This service can cost you $3 per runner or more. If you are having well under 100 runners or so, you might try to time the runners yourself and save the cash, but this can be difficult. The facility. Especially if weather can be an issue, you might need an indoor facility like a church, school, or civic center for both before and after a race. The facility should hopefully have plenty of restrooms complete with plenty of toilet paper. Tables, chairs or benches are also a plus. A sound system is nice for music and announcements. If the facility doesn't have a lot of toilet facilities you should look into renting portable toilets. You should probably have at least two toilets for every 100 runners. Some facilities, such as in public parks or universities, require permits and fees. Make sure that there is plenty of parking nearby. Promotion. Get an attractive flyer put together and cover all the basics (race name, charitable affiliation, location, time, awards, age groups, t-shirts, door prizes, waiver, etc.). Limit it to the front and back of one sheet. Get the flyer in the local running club newsletter at least a month before the race. Get it placed on the local race calendars and the Internet (local running club web sites, active.com, marathonguide.com, etc.). Put flyers around on community bulletin boards, especially at fitness centers and sporting goods stores. For charity races, try TV/radio public service announcements (especially if the race benefits a local charity) or news releases for various newspapers. Keep a database of participants after each run and send e-mail or postcard reminders and/or entry forms in advance of next year's race. Volunteers. Volunteers can make or break a race. You will need volunteers to help with pre-race registration, race day registration, aid stations, and post-race activities. They will probably need a lot of direction as they may not be runners themselves. Get as many as you can. You might offer volunteers a perk such as a free shirt. The involved charity may be able to supply some volunteers. Make sure you get definite commitments and responsible individuals. Shirts. An attractive shirt is a real plus. Most runners have come to expect a shirt (but there are other possibilities such as towels or hats). Try to find or create some especially good or unusual artwork. A graphics designer can help and most T-shirt printers provide artwork. Short-sleeved shirts are cheaper than long-sleeved and many runners prefer short sleeves. You should probably go with 100% heavy-duty cotton, but you can try for a dri-release (technical) shirt (much more expensive). Get you artwork and screen-printing planned many weeks ahead of time. You can usually have the shirts ordered and printed about two weeks before the event for those who have preregistered and then make arrangements with the printer to have a follow-up order for the late registrations (to be picked up at the local running store the week following the race). That way, you don't have to guess on the quantities and sizes. It's bad news when you order 100 shirts and either only 50 runners show up or 150 show up. Printed shirts can cost around $7-$10 on average, depending on front and back printing, multiple colors, quality of the material, etc. Awards. Most runners expect awards, usually the top overall male/female, top masters male/female (40 and up), and three deep in age groups. 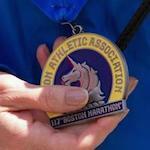 Consider a Veteran category (55+) or Clydesdale/Athena (somewhat heavier runners, like 180+ for men and 140+ for women). If you only have 100 or fewer participants, ten-year age groups are probably adequate. If more than 100, you should consider five-year age groups. Trophies can be expensive ($5 or more each). You can try to be more creative and save money with non-traditional awards/trophies (for example, light bulb trophies for the Hot'n'Hilly Powerhouse Run or boxes of chocolates for a Valentine's run). Some runners are tired of the gold running statuette on a fake marble base. The good runners like the recognition mostly, but I would avoid the cheap ribbon or medal award. Medals. If you are offering a half marathon or marathon, runners might expect a nice medal for all their efforts (especially for a marathon). A custom designed medal is much better than a generic medal (and more expensive). Custom medals may cost about $100 for setup and maybe $5 each (sometimes a minimum order of 50 or 100 is involved). Check around for prices, but you must make sure they can deliver on time--plan way ahead of time if possible. Photos. Make arrangements with someone to take lots of photos before, during, and after the race, including the awards ceremony. You can use these photos on web sites, in news releases, and for future promotions. Race day activities. Create a checklist of things to do on race day well in advance. Get your volunteers there early to set things up. Race day registration can be hectic, so have plenty of volunteers to help people sign up, give out shirts, fill out race bibs, etc. BE ORGANIZED! Volunteers are also needed to clean up after the event. You might want to arrange for some good, loud (tasteful) music (recorded or live) before and after the race. Make it a festive atmosphere. Have plenty of cash available to make change for runners registering on race day (and make sure you protect that cash and protect all the cash and checks received). Prepping the course on race day. Place some very obvious mile markers on the course, preferably on signs (not just painted on the road). You can also place directional arrows on signs stuck in the ground or on orange cones at every turn. You should place volunteers at every major turn so runners don't go the wrong way. Volunteers can also be placed at more dangerous intersections to try to slow cars down. However, you may need police to control busy intersections, and police often charge for their services. The race start. Obtain a bullhorn or other portable sound system to make announcements. Warn runners about any tricky turns, busy intersections, or dangerous road conditions. Thank them for coming and thank the sponsors. Try your best to start on time. If possible, have someone on a bike ride ahead of the crowd to show them the entire course. Port-a-johns. If you don't have a facility with lots of restrooms, you will need one or more port-a-johns. I would recommend something like about two toilets for every 100 runners. Make sure they are stocked up with lots of toilet paper for both before and after the race. You may also need toilets on the course for longer events. Your volunteers may also need access to one so you can place a toilet near each aid station. Food and drink . Runners like food after a race. You can go with healthier foods like fruit and bagels after a 5K/10K. For a half marathon or marathon, you might want to consider some real food (pizza, chili, soup, sandwiches), but you will need to include the cost in the entry fee, or you could have some vendors set up. You could also provide water and/or power drink before the race, and definitely after the race. Aid stations. You will probably need aid stations every 2 miles (maybe every mile in very warm weather). They should at least offer water. Provide water and power drink for the longer runs (10K and up). For half marathons and up, consider cut-up fruit and maybe power gels. You probably need at least a couple of volunteers per aid station. They MUST keep cups available for the runners--don't make the runners stand and wait for a drink. They will need plenty of supplies and tables/chairs. They will need a way to keep warm in cooler weather. They will also need to pick up the cups thrown away by runners, possibly for a hundred yards down the road. Placing some large trash barrels 50-100 yards after the aid station could help, but don't leave trash in the area. Race results. Either you or the race timing service should tabulate the results as soon as possible after the race so that awards can be presented quickly. For a 5K, shoot for one hour after the start; for a 10K, maybe 1.5 hours after the start. Get the race timing service to agree to this. Also, make arrangements for the results to be posted on the Internet as soon as possible. Runners want to know how they measure up. Awards ceremonies. Try to start the awards ceremony as early as possible. It helps to have an entertaining individual or celebrity present the awards. Keep the awards ceremony moving quickly. You may need volunteers to help hand out the awards. Door prizes. Offering door prizes to runners at random after the race can draw even more participation. Make sure it is a random process. Door prizes also helps fill the time between the end of the race and the awards ceremony. If you have businesses donate some really expensive items you might want to consider a silent auction to raise money for a charity. Possible certification. If the course is relatively flat with few turns and the weather is favorable, some runners may be attracted to the race for possible state age group records. A course must be certified by the USATF to qualify for records. It is a fairly difficult process, but anyone can learn how (see	www.usatf.org). It can take one person 10-20 hours (depending on skill and experience) to certify a course, or you can pay someone around $150-$300 to do it for you. The USATF certification fee is $25 and the certification is good for 10 years. If the course is very hilly, has many, many turns, or the event is in the summer, don't bother, unless you just like the idea of the course being "official." Audie is a native of Fayetteville, Arkansas and a graduate of the University of Arkansas. He now resides in Joplin, Missouri where he is an avid distance runner, business owner, and the co-race director of the Joplin Memorial Half, an event created to honor the 161 individuals who lost their lives in the Joplin tornado of May 22, 2011. Audie was selected as one of Runner's World magazine's 2011 Heroes of Running.